Basically, tossing them in olive oil, dusting with a bit of salt, garlic and herbs, and baking at a low temperature for an hour – makes them unbelievable. Wash all whole tomatoes thoroughly under clean, running water. Cut each half in 4. 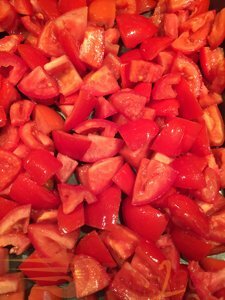 Place tomato pieces into a Strainer and toss with salt and sugar to drain off liquid. 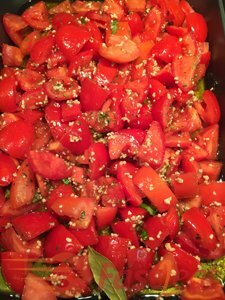 Put the tomatoes onto a large rimmed Baking Sheet . Toss in all other ingredients. Stir until well-coated. Roast in the oven for 30 minutes. 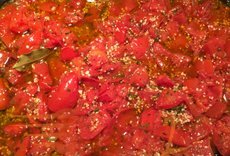 Using a Spatula , stir the tomatoes and roast for more 30 minutes until tomatoes are softened but not falling apart. Taste and add additional salt and pepper if desired. Remove Bay leaf and set aside. To store, place in clean Airtight Containers . Eat with toast, breads, crackers, salads, pasta, goat cheese, bocconcini or refrigerate for up to 2 weeks or freeze for up to a couple of months. 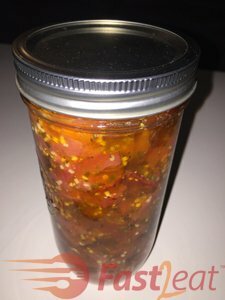 I suggest using Roma or Plum tomatoes because they have thicker flesh with fewer seeds and less juice than regular tomatoes, but feel free to use any tomato for this recipe. You can add other fresh hardy herbs such as fresh thyme, rosemary… as desired.